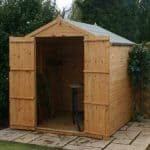 If you do not have a whole lot of space in your garden, or even if you are just looking for a well made shed that is being sold for a very affordable price, then the Hartwood 6′ x 4′ FSC Overlap Reverse Apex Shed is for you. 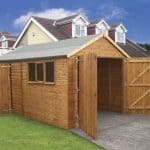 This is one very attractive shed that has a very smart design which is really going to look impressive in your garden. Its reverse design with the door and the window right on the front really is quite eye catching. 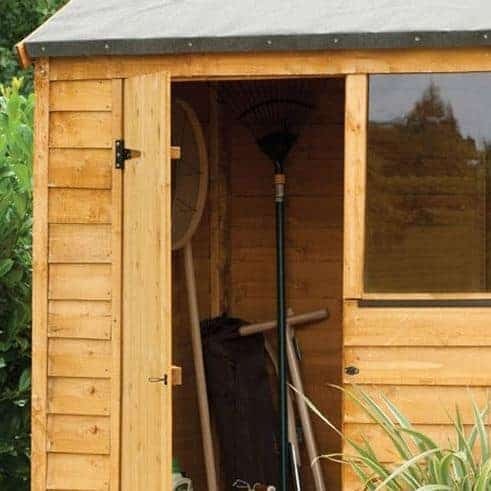 The storage space on offer from this shed is actually quite impressive and if you think before you place things then you can really store a lot of items in here such as gardening equipment, tools, garden toys and many other things. The shed has a very appealing look, but it is also very strong this starts with that impressive, 8 mm thick overlap cladding which they have used for the walls. To go along with this we have a robust frame inside the shed that will keep it strong. So that you can store many items inside the shed, a strong solid sheet boarding floor has been used. That apex roof is not just there to look nice it is there to also ensure that you have no issues of rain getting into the shed. With its reverse design the Hartwood 6′ x 4′ FSC Overlap Reverse Apex Shed is one very nice shed to look at. We are really impressed with how classy they have made this shed and feel that the design of it would make it something that really would blend into any style of garden. 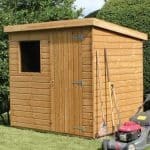 It is a very decent size and while it is called a 6 x 4 shed, actually the width is a little over 6 feet so you do have a fairly decent amount of storage space in here. the depth of the shed is right around 4 feet so while not an overly large shed there is still plenty of room for you to store items and potter around. Along the ridge the shed is actually offering you quite a bit of headroom as it is just a hair over 7 feet high, even the eaves height is very respectable at 5 feet 3 inches. As this is a reverse style apex roof, the water will run off at the front and the back of the shed. This means that you do not have to worry about water sitting on top of there, trying to find its way inside. There is some very attractive looking sand felt on the very top of the roof that is used to protect the solid sheet boarding underneath. This is actually far stronger than you may think as it can take the weight of lots of snow and even some kind of meeting of all your neighbours cats gathering on top of it. This shed used 8 mm thick overlap cladding. We love the way this looks as we feel that it has a very classy kind of look. It has a rustic charm that you just do not get from other kinds of cladding. They have not just selected this cladding for you to gawk at and show off to your neighbours They have used is because it does a great job in keeping the elements at bay and it is also very strong. The framing inside here is something we have seen in this Harwood range before and that is a 28 mm x 28 mm frame. We really like this frame as it is strong and will ensure the shed stays firm for many years, but it is not overly bulky so that it will eat into your storage space. A good frame should be something that does an amazing job, but you never notice it is there and that is what we feel this one does. The shed uses solid sheet boarding for the flooring just like the roof and this is a very clever design choice. This boarding is more than able to handle the weight of your tools, gardening items, lawn mower and even you when you are hiding out from the other half. 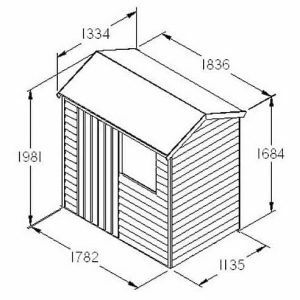 The Hartwood 6′ x 4′ FSC Overlap Reverse Apex Shed will be given a surface finish at the factory which will give it a little bit of protection, but you will need to give it a proper coating of wood treatment in order to keep it safe from rot. An annual coating of treatment should be applied to ensure rot and decay do not happen. 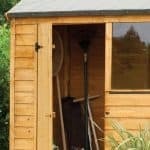 The shed comes with a ten year guarantee that covers you against rot, but you have to treat and look after the shed properly in order for this guarantee to be valid. They have done a very good job on the door of this shed. First of all, even though this is a single door, we do not see you having any issues getting anything inside or out of the shed. The door is very well made as it has some extra framing on the back to keep it strong and it is secured to the shed with these two large black hinges. Right next to the door is a fixed window. We really like how this window is on the front of the shed as we feel that this way you are going to get lots of natural light into the shed. The window is made with shatterproof styrene that is 2 mm thick. If you have a family then this type of glazing is perfect as it means even if your child has a right foot like Ronaldo, that window will not leave dangerous broken glass all over the place. The door has a hasp and staple which we like, but there is no included padlock. So while the door will stay securely closed, you will have to purchase some kind of lock if you want to make sure your belongings are safe from thieves. Of course that fantastic window that is on the front of the shed does take away a fair bit of privacy, but to be honest we are fine with this as it is such a great feature. Plus if you do not want people to look inside your shed then you could add a curtain or a set of blinds. Give the shed a little bit more of a personality by treating that wood with some coloured treatment. This way you can take care of two things at once. 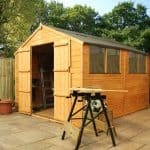 Apart from this there is not really anything else you can do to change the appearance of the shed. 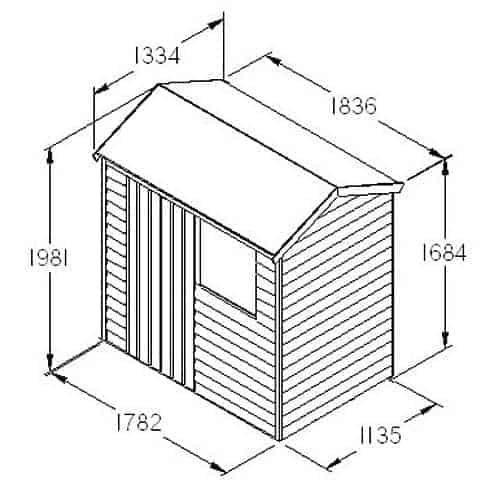 If you are a little concerned about the floor where you will be installing the shed, then you may want to consider adding their plastic shed base which costs £69.99. They also offer a couple of extras that will help upgrade your security. First of all is their standard hasp and padlock set which is not some cheap brand it is actually a Yale branded hasp and lock and can be added for £19.99. A more advanced and pretty cool, electronic alarm system is also available which will really kick your security up a few notches. This can be added for £29.99. Well made, smart design and in general one very high quality shed that is being sold for a price that is really quite remarkable. 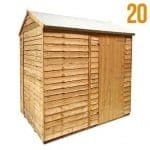 They are so confident in the longevity of this shed that they are willing to give you a ten year guarantee. Of course you do have to treat the wood once a year, but this is a small price to pay for a shed that is going to last you 10 or more years. 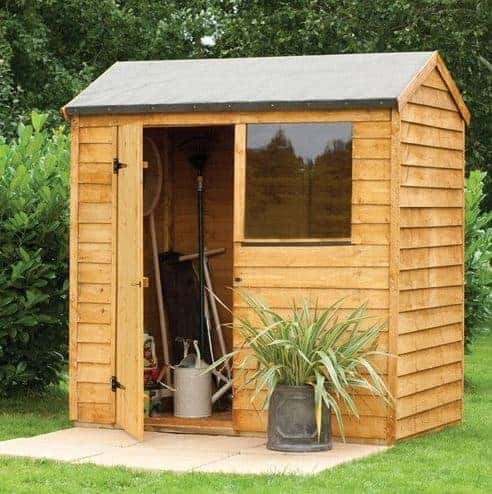 6 x 4 is not the largest sized shed in the world, but it is a very good size for small families or even for a person who just needs some extra storage space to keep all of their cool stuff. As long as you have the snack tin handy this will be a rather positive and fun experience. Be sure to have a friend there to help though as this is a two person job. It should take you around 4 to 6 hours and hopefully your friendship will be intact by the end of it. 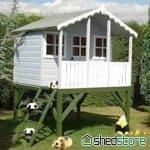 Considering the overall very impressive quality of the shed this is actually something we consider to be very good value for money. 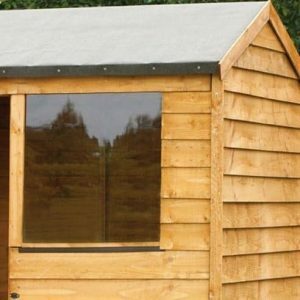 Final Thoughts: If you want a shed that has a lot of style, charm and class, but is also strong and long lasting, then the Hartwood 6' x 4' FSC Overlap Reverse Apex Shed is a shed that you simply must consider. 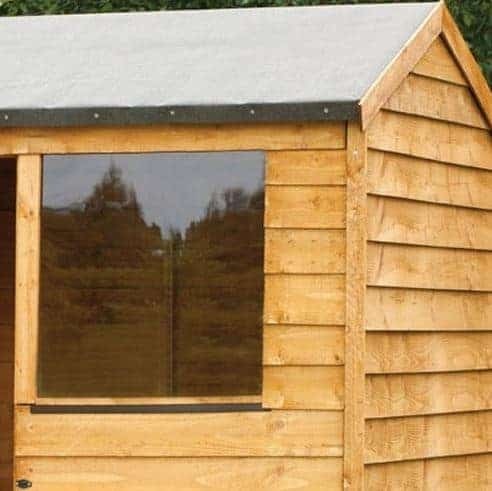 We really like the design of this shed and are actually pretty blown away at the high quality of it considering that it is being sold for under £200. While the storage space it offers is better than you would expect from a 6 x 4 shed, it will not take up a whole lot of room in your garden. This is a shed that we really do like and feel that if you want a good cheap shed that has a lot of style then this is the shed for you.